Move over eBay: The next wave of resale shopping is here. Akin to brick-and-mortar boutiques, Twice and Threadflip auctions for more personalized shopping that reaches a broad audience in the re-commerce space. With a whopping 2.5 billion pounds of post-consumer textiles wasted in the U.S. annually and apparel prices rising, these two re-commerce upstarts couldn’t be more timely. Ecouterre gets the scope here for our eco- and cost-conscious readers. The brainchild of Noah Ready-Campbell and Calvin Young who met as engineers at Google in 2010, Twice offers lightly loved name-brand womenswear and accessories from Missoni to Anthropologie at 70 to 90 percent of the retail price. “Twice is a fashion marketplace in the collaborative consumption business, much like how AirBnB is changing the way we book accommodations and Getaround is revolutionizing car sharing,” Ready-Campbell tells Ecouterre. 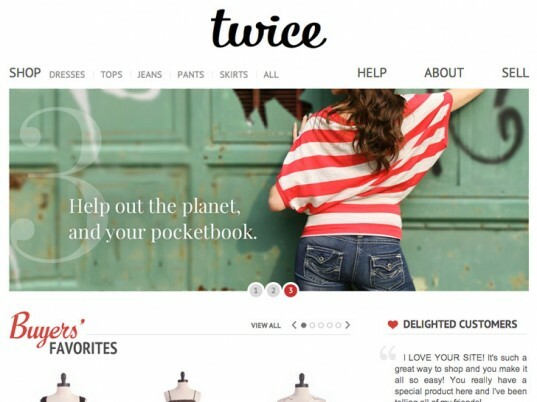 With an inventory of more than 7,500 items, Twice purchases items directly, paying sellers cash upfront and handles all of the photographing, styling, listing and selling of the items. Buyers receive standard and new perks like free returns for 30 days, free shipping for orders over $49 and 24/7 customer service. Notable items de jour: a gorgeous Prada ruffle back dress for $198 (80 percent off retail) and a Michael Kors raw-silk plaid dress for $224 (85 percent off retail). Will men get to sell and buy their name-brand duds, too? “Right now we’re 100 percent focused on building the best experience for buying and selling women’s fashion, but we do have plans to expand to additional retail categories such as menswear, children’s and accessories in the future” Ready-Campbell says. 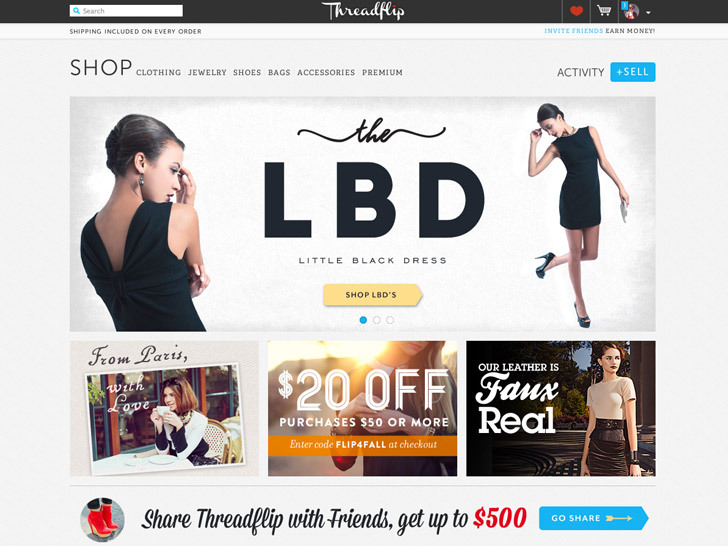 Inspired shoppers can use the tailored browsing system to find items matching their personal style or check out the latest looks by Threadflip’s featured stylist. Haven’t worn your Prada boots in two seasons? You can consign them on Threadflip (it takes a cut of the sale). If you don’t want to deal with the hassle of consigning them, Threadflip also offers a “white glove” service that takes care of photographing, styling, uploading, and shipping your item for a fee. To get Ecouterre’s readers making the most of each others’ closets, Threadflip is offering a $20 off any purchase with the code FLIP4FALL. In addition to revolutionizing the re-commerce space, Twice and Threadflip are impacting our society and environment. Using the buy-one-give-one model popularized by TOMS, for each box of clothing Twice receives from customers, it donates a box of clothing to Goodwill. For its part, Threadflip is protecting water and animals, partnering with non-profits Charity: Water and the Rescue Paws Foundation. Affordable designer resale and charitable giving? Now that’s a “re-volution” we can get behind. Another great fashion re-commerce site is Dresm.com. It's less designer oriented and more peer to peer ecom focused. It's easy and cost effective to buy and sell new or used clothing, footwear and accessories. Move over eBay: The next wave of resale shopping is here. Akin to brick-and-mortar boutiques, Twice and Threadflip auctions for more personalized shopping that reaches a broad audience in the re-commerce space. With a whopping 2.5 billion pounds of post-consumer textiles wasted in the U.S. annually and apparel prices rising, these two re-commerce upstarts couldn�t be more timely. Ecouterre gets the scope here for our eco- and cost-conscious readers.